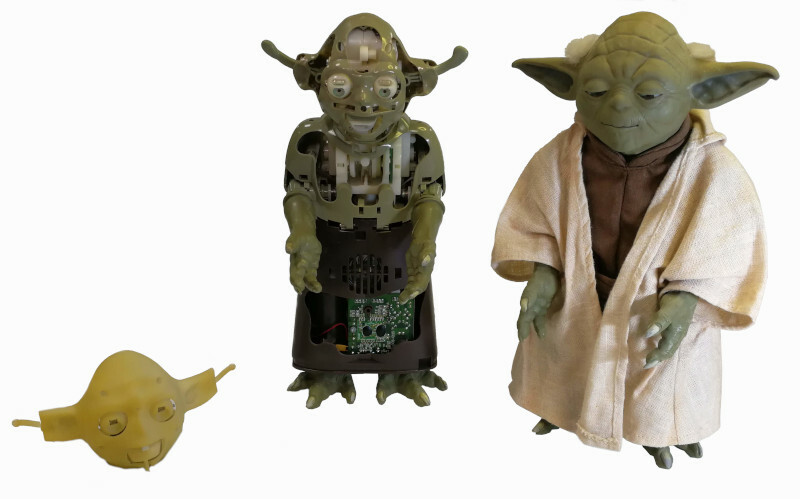 Many design constraints, Hasbro had: a complex set of mechanisms, they wanted, that would allow the toy’s ears to wiggle, its eyes to blink, its arms to lift, its mouth to move (synchronized with the audio played by its internal electronics), & its torso to bend at the waist, all contained within the pre-defined envelope of the toy’s outer profile & powered with only a single motor. Obviously, in an office full of science fiction fans, there were no half-measures taken to fully realize the Jedi master. The final mechanism uses more than 20 unique pieces in the head alone, including pulleys, gears, springs, cam clusters, & the motor itself. The toy’s robes conceal a robust switching geartrain that creates all the desired motions in a convincing fashion.